Access for Women in Energy (AccessWIE) engages its members in a range of activities, all aiming to promote the development of women in the energy sector, globally. All our events are by invitation only. Our premiere event took place on July 23rd, 2007 at Eversheds LLP and focused on the sustainability of nuclear energy. 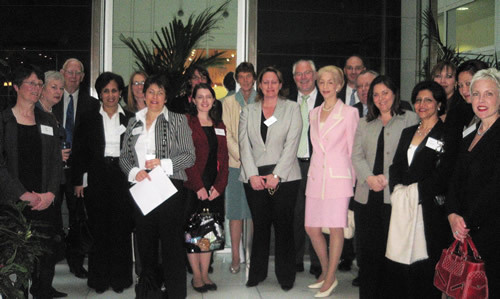 AccessWIE launch at Eversheds, in 2007. Participants included Lady Barbara Judge, UK Atomic Energy Authority; Dr Carole Nakhle, Director of AccessWIE; Ann Cormak, BIEE; Joan MacNaughton, DTI; Michelle Thomas, Eversheds; Lord Howell, House of Lords; Gilian Butchart, KPMG; Siham Razzouqi, OPEC; and Latifa Anbari-Debar, Shell. AccessWIE runs exclusive roundtable discussions, to address strategic issues involving energy globally. Our roundtable events are typically held in a dinner format. AccessWIE organises regular informed debates on global energy related issues. These are usually held on a quarterly basis. In 2017, AccessWIE embarked on its first annual Energy Mission. Targeting a major energy producing and consuming country, a mission features a carefully selected and balanced variety of meetings with leading government institutions and private organisations. AccessWIE members participating in the mission acquire a comprehensive overview of business opportunities in the energy sector in the country visited and establish a valuable business network at the highest level. AccessWIE provides training support to its members who want to venture into new areas of the energy industry or simply expand their knowledge. We work with respectable academic institutions, such as the Surrey Energy Economics Centre (SEEC) to hold such events. Previously, we also collaborated with the Greek Energy Forum Academy – Energy Union for Future Leaders, to deliver training held under the auspices of the European Commission. Read more here. AccessWIE gives career talk and advice, sharing a wealth of industry experience and insight, in order to empower women to achieve their aspirations. Through our social media, AccessWIE enables members to exchange news and views, identify new business opportunities and entrepreneurship, fill job vacancies and promote their own expertise. AccessWIE is a non-for-profit group that operates under the generous support of sponsors who are strong advocates of empowering women in the energy sector. Crystol Energy sponsors and supports AccessWIE.